A blanket of smog envelopes Kuarmunda and Bonai subdivisions of Odisha’s Sundargarh district every morning. Area residents attribute it to emissions from sponge iron factories nearby that switch off their emission control devices—electrostatic precipitators (ESPs)—at night. The reason these factories get away with such offences is weak rules and weaker enforcement. The Central Pollution Control Board (CPCB) has classified sponge iron as red category industry which denotes its high potential to pollute. The classification means the industry needs strict pollution norms and guidelines and should be monitored and inspected regularly. On both these counts, the regulatory framework fails miserably. 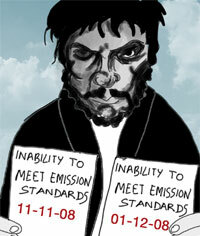 The first step to tighten regulations on the industry was taken in 2006 when CPCB released a draft standard. It contained detailed emission and effluent standards, waste management measures and guidelines on locating factories. Two-and-a-half years later, the Union Ministry of Environment and Forests (MoEF) notified a highly diluted version of the draft. A former CPCB officer who helped prepare the draft said MoEF watered down the standards “under pressure from states and the industry lobby”. Most of the guidelines were dropped before notification, he added. The draft had suggested phasing out factories with less than 100 tonnes per day (TPD) capacity because such units can ill-afford clean technologies. The notification dropped this suggestion. The notification also decreased stack (chimney) height specification. CPCB had proposed a minimum height of 75 metres; the notification reduced it to 30 metres. Higher stacks mean emissions can be dispersed over a larger area, reducing their impact. Fugitive emission standards, too, were toned down. These emissions, separate from stack emissions, arise from raw material and product handling and disposing of solid waste. It was fixed at 1,000 microgram per cubic metre (μg/m3). The notification relaxed this limit to 3,000 μg/m3 for existing factories, and 2,000 μg/m3 for new ones. The notification’s biggest weakness is that it is silent on solid waste disposal. The draft had recognised char, kiln waste, scrubber and flue dust as solid waste and had prescribed strict recycling and reuse measures. The rest of the CPCB recommendations now form a part of the Charter on Corporate Responsibility for Environmental Protection. 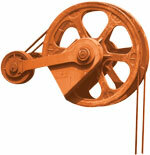 These are guidelines meant for various industrial sectors and are voluntary in nature. Even after the diluted standards came into force in May 2008, record for enforcing these standards and their compliance is abysmal. “It is too soon to allege the industry is one of the biggest polluters and no action is taken against them,” said an MoEF official. But reality is different. The Nova Iron Factory in Chhattisgarh’s Bilaspur district, for instance, showed stack suspended particulate matter (SPM) at 2,292 mg/m3, as per an inspection record of June 2009. The limit for stack SPM is 100 mg/m3. (see ‘What standards prescribe’). The main problem in compliance is nonoperation of ESPs, said Subrata Ghosh, chief engineer with West Bengal SPCB. Another factory, Shiv Metallics, in Sundargarh district of Odisha, showed ambient air SPM of 2,025 μg/m3 which is about 20 times the present standard. No action was taken against the two, and the list of such factories is unending. Another reason for pollution is proximity between sponge iron factories. These usually grow in clusters in the vicinity of areas rich in iron ore deposits and coal. The voluntary guidelines on location of factories are ignored, leading to conflicts between industry owners and residents. The guidelines state the distance between two sponge iron factories should be five km for those with 100 TPD capacity or more. The guidelines also specify a minimum distance of one km between the factories and human settlements. In places like Sundargarh district in Odisha and Raipur district in Chhattisgarh, these factories are right next to residential areas. When asked about enforcing site guidelines, MoEF officials said they could not do much as land is a state subject. “We provided the basic guidelines so that states can formulate policies accordingly. Compliance with guidelines has to be ensured by SPCBs and the states,” a ministry official said. Activists say the main reason for rapid growth of the sector is the willingness of states to subsidise inputs, easy access to market and availability of cheap raw material and labour. There are numerous examples of sponge iron factories in the country flouting norms without being brought to book. In 2009, the Centre for Science and Environment (CSE), a Delhi non-profit, studied compliance with environmental norms in the sponge iron sector. It is the biggest sample study in the country so far ; a total of 204 factories were scrutinised on the basis of inspection reports. These were collected from SPCBs of four states where sponge iron industry is dominant —Jharkhand, Chhattisgarh, Odisha and West Bengal. 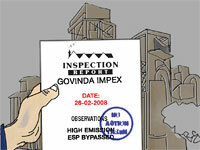 A total of 449 inspection reports, including night inspection reports, were made available for the period 2006-2009. They contained status of pollution control measures, compliance with norms and notices served. In addition to these, 265 stack monitoring reports were made available for the period 2006-2010 for Odisha, Chhattisgarh and West Bengal. 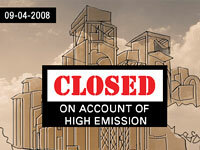 Hundred and eighty nine ambient air quality reports were also provided for factories in Odisha and Chhattisgarh. Monitoring inadequate: Analysis of the data in these reports threw up startling results. For one, it showed how inadequate monitoring is. The SPCBs inspected sponge iron factories once or twice a year; the CPCB guidelines specify they should be monitored every quarter. In Jharkhand, Odisha and Chhattisgarh, most factories were inspected only once a year. In West Bengal, they were inspected at least twice. Enforcement is a problem, conceded a CPCB official. He said neither the CPCB nor the SPCBs have sufficient manpower to monitor each and every factory. So, the effort has to come from the industry. NGOs could also keep a tab on defaulters, he added. ESPs absent or not used: About 10 per cent of the factories studied were operating without an ESP in the main kiln which is a prerequisite for a factory to start production. This means the SPCBs did not inspect factory premises before production started. In Jharkhand, a fourth of the factories started operating without ESPs; they were later directed by SPCB to install one. In Odisha, 20 per cent factories did not install ESPs before starting production. The factories have a worse record when it comes to operating ESPs. Data shows, 37 per cent of the factories had non-functional or partially functional ESPs. Even where ESPs were in running condition, leakage of emissions from kilns were recorded in 60 per cent inspection reports. Odisha reports showed leakage in 37 per cent kilns with ESPs. In West Bengal, 92 per cent factories recorded emissions despite ESPs. Sometimes SPCBs, acting on public complaints regarding increased pollution at night, conduct surprise inspections. 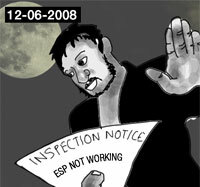 The night inspection reports showed higher non-compliance. They showed 73 per cent sponge iron factories operated their ESPs partially at night and 27 per cent did not operate them at all. This means, 100 per cent factories were bypassing ESPs and releasing emissions into the air. A Karnataka SPCB official said sponge iron factories “save electricity by shutting down ESPs at night and as a result compliance with emission standards is minimal at night in sponge iron dominated areas”. 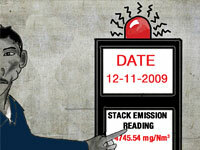 Emissions high: Pollution monitoring from stacks is also infrequent, the data showed. 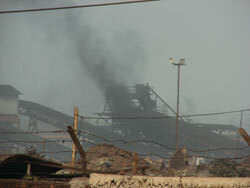 Jharkhand SPCB failed to provide even one stack monitoring report for sponge iron factories. The Odisha SPCB carried out stack monitoring of only half the factories in 2008- 2009. West Bengal SPCB scored better. It monitored 75 per cent factories; some were monitored as many as three times a year. The stack monitoring reports also show 26 per cent factories flouting emission standards. West Bengal topped the list with 52 per cent factories failing to meet emission standards. Chhattisgarh is second in the list with a non-compliance rate of 36 per cent. Inspection reports showed 42 per cent factories failed to meet ambient air quality standards. In Chhattisgarh, the highest ambient SPM was recorded near the Kalindi Ispat factory in Bilaspur district— 1,129 μg/m3. The standard for ambient air quality is 100 μg/m3. The factories also fail to comply with other parameters like fugitive emission norms and disposing and handling solid waste. The waste is supposed to be covered and stored; 80 per cent factories were storing it in the open and many of them were dumping char outside their premises. If one takes into account all compliance conditions, close to 50 per cent factories were found non-compliant on the day inspections were conducted. But these inspections are infrequent. If the factories are monitored regularly, the non-compliance figure would be much higher. The highest level of non-compliance was found in Chhattisgarh—a whopping 100 per cent. West Bengal, with a non-compliance rate of 41 per cent, is second. A formality called notices: Pollution control agencies have a standard procedure for dealing with factories defying pollution norms. 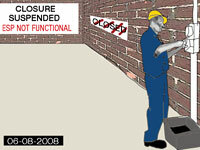 They issue show cause notices; when offences are repeated, closure notices are sent. But are these an effective deterrent? The answer is no. Take the instance of Odisha where the SPCB issued 137 show cause notices over the past five years. Out of 74 factories for which information was made available, 45 per cent (33 factories) were served show cause or closure notices for reasons such as high emissions, defective pollution control devices and improper solid waste disposal. But in spite of the notices, many factories remained repeat offenders. In West Bengal, the SPCB issued 250 closure notices to 50 factories over the past four years, without any effect. In Jharkhand, 21 show cause notices were issued to 24 sponge iron factories between 2007 and 2008 for not installing or operating ESPs and for flouting other pollution norms. Notices were issued and later withdrawn without achieving any result. The cycle follows a routine. SPCB inspects a factory and issues show cause notice for not complying with norms. In the next inspection, the factory is again found violating the norms and issued closure notice. The third inspection report states the faults have been rectified and the closure notice is suspended. A retired CPCB official said issuing notices and withdrawing them is a means to collect bribes from the factories. 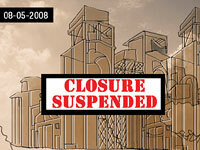 In some cases, bank guarantees of factories issued closure notices are forfeited. But the guarantee amounts are usually meagre and hardly a deterrent.